Keeping your canine friend close by when you’re out and about is important, but you also need to be sure they are comfortable and safe. Picking the right harness will ensure your dog has a safe and secure walk with you, so you can both enjoy your time outdoors. Not all harnesses are suitable for every type of dog, so be sure to check with the supplier first before you buy. Most suppliers will provide size guides and give you instructions on how to property measure your dog for the best-fitting harness. Dogs who tend to pull when on a lead, particularly younger or more energetic dogs, can strain too much and cause themselves an injury when using a regular collar. But, when using a well-fitted harness, the pressure on them is better distributed which will be a much more comfortable experience for them and will reduce any pain on the shoulder and neck areas. Harnesses are also great for training dogs – when straining on a collar, a dog will tend to pull more, but when using a harness you can train your dog to walk alongside you without pulling. If you are going on long, all-day walks with your dog, some harnesses can become uncomfortable. Also, for some long-haired dogs, their hair may become tangled in the harness, causing them some distress. That said, many dogs are happy to wear a good-fitting harness all day so don’t be afraid to try it and enjoy your walk. But, for badly behaved dogs they can cause problems because they can give you less ability to control them. 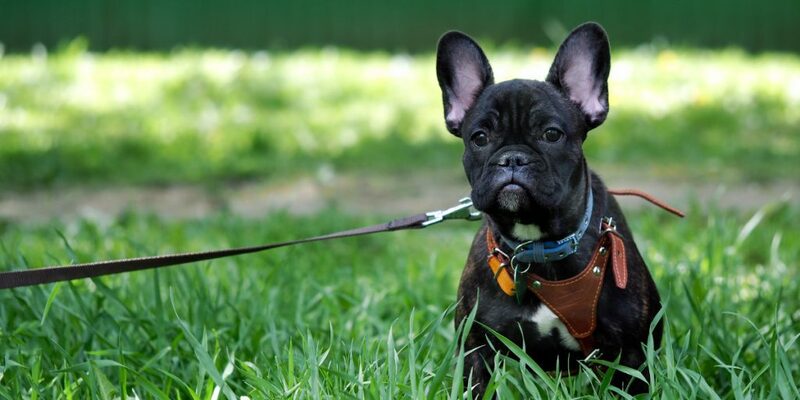 Consider your dog’s behavior before selecting a harness to avoid causing discomfort to your canine friend. The Embark Active Dog Harness is a perfect harness for dog owners who are, as the name suggests, active with their dogs. It’s a high-quality, padded harness that will ensure that your dog is comfortable and will give you more control over their movement. The Embark Active Dog Harness is quadruple sewn with military grade nylon thread which withstands not only the normal wear and tear of an active outdoors dog, but also the test of time. It is perfectly suited for service, rescue and stronger dogs that might make light work of lower quality harnesses. The harness is also compatible with seat belts, so taking your dog for a ride is not a problem now. The Embark Active Dog Harness features a no pull front lead attachment which is used for training when you are walking infant with your dog. With this feature in the harness, you can teach your dog to heel and to stop pulling. However, it is important to understand that front attachment point is not designed for regular stress whereas the back attachment point is for everyday use. The Embark Active Dog Harness is one of the most popular and reliable dog harnesses available right now. It provides you with full control over your dog and ensures that the fit is comfortable and safe, allowing you both to enjoy your walk together. Highly recommended! This is the best choice for owners of active, outdoorsy dogs. Everyone loves walking their dog, but there are times when they get a little bit too excited and pull on the lead. This can cause your dog discomfort, so it’s worth considering a good, padded harness for animals that pull too much on leads. The Julius K9 Powerharness is a fantastic harness for active dog owners – it’s one of the most popular harnesses on the market right now. 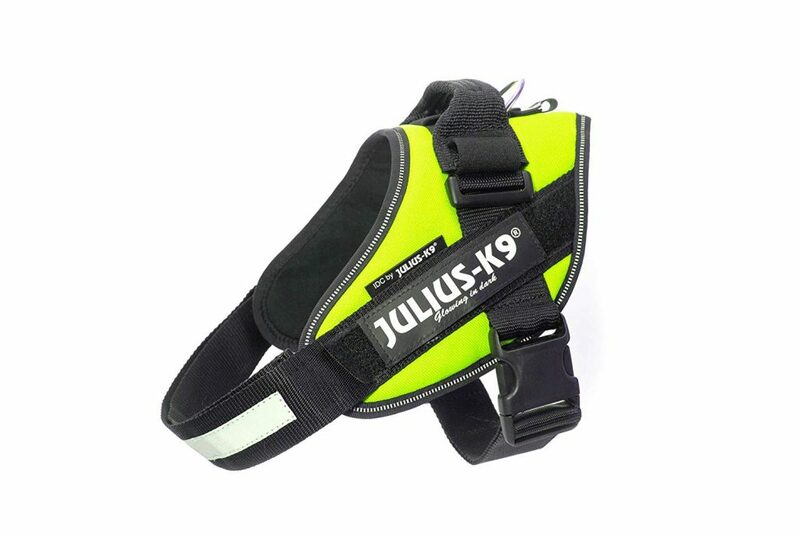 The Julius K9 Powerharness is not only great quality, but it works as a visibility vest as well. The grey line on the chest and sides of the harness act as reflective surfaces to help keep your dog visible when you go out for a walk. This is great for people who tend to walk on cycle or other routes that may not be well lit and have the risk of cyclists or runners accidentally bumping into your dog. The OKEO-TEX material is designed in line with the highest standards and ensures that your pet can breathe and move freely. It has a skin friendly inner lining, and this keeps your dog safe and secure. The harness is clearly designed for active outdoors dogs. It comes with an adjustable handle to help your dog out of tight spots, flashlight pouch and the larger versions of the harness also have attachable pouches. This makes the Julius K9 Powerharness an ideal choice for service dogs. The Julius K9 Powerharness is a solid choice for active dogs and is the first choice for dog owners who need a strong and sturdy dog harness for powerful dogs. This is another great choice for active dogs, particularly medium or large dogs who may need to be supported by a strong and sturdy harness. OUTRY Tactical Dog Training Harness is made of tough and highest quality nylon, which is ideal for stronger and more active dogs who may damage low quality harnesses. It has a breathable mesh underneath the material, so prolonged use of the harness is possible, but we recommend still to keep an eye on your dog’s comfort levels if you’re planning on walking all day. 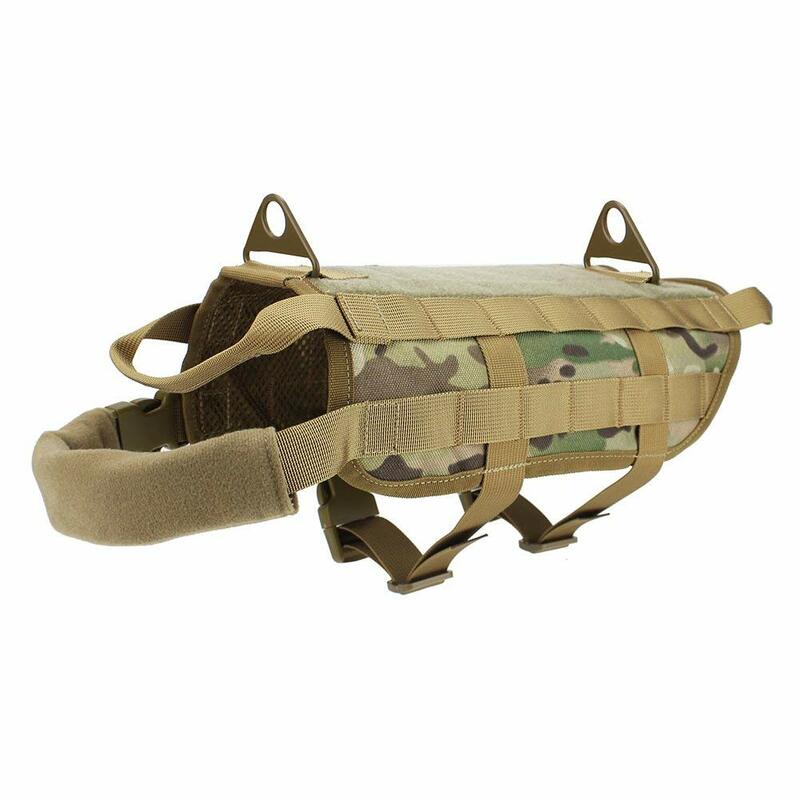 The OUTRY Tactical Dog Training Harness has a Molle and Velcro system which allows your dog to carry some supplies while hiking or on longer walks. You can even attach a GoPro or other camera to your dog (but we’re not taking any responsibility if they become more Internet-famous than you!). The harness is designed with nylon grab handles and metal leash anchor points to provide you complete control over your dog and keep it safe at all times. The Outry Tactical Dog Harness is another fantastic choice for dog owners who enjoy hiking and long walks with their canine friend. It’s strong, durable and has a breathable mesh underneath the material to ensure your dog stays comfortable throughout the day. This is one of the best harnesses for dogs that pull. The PowerLead dog harness is essential for any dog owner. PowerLead products have maintained their standards as being one of the most reliable and toughest dog’s product providers in the country. Weighing an approximate 272g only, the harness allows your dog to roam around freely without any heavy push applied on their backs. This allows them to stay injury free and happy. 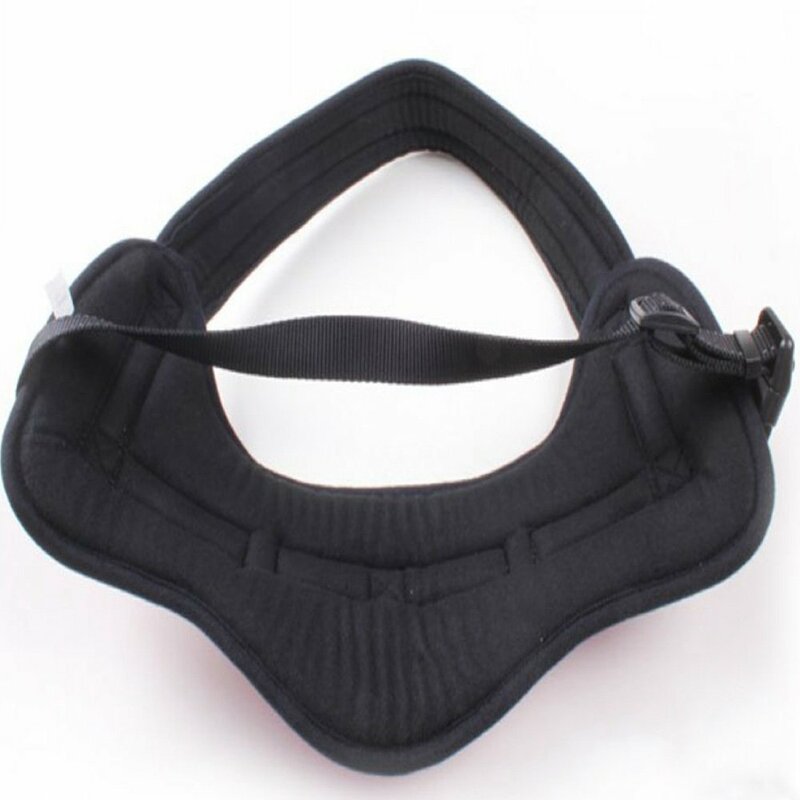 The padded base of the harness also contributes to the comfort and care of the dog. The 19.8 x 16.4 x 4.4 cm dimensions of the product are large enough to cover half of your dog’s back, again ensuring full comfort and safety of not just the dog, but the owner a well. The product comes in four sizes: small, medium, large and extra-large, providing you with a variety to choose the best-suited harness for your dog from. 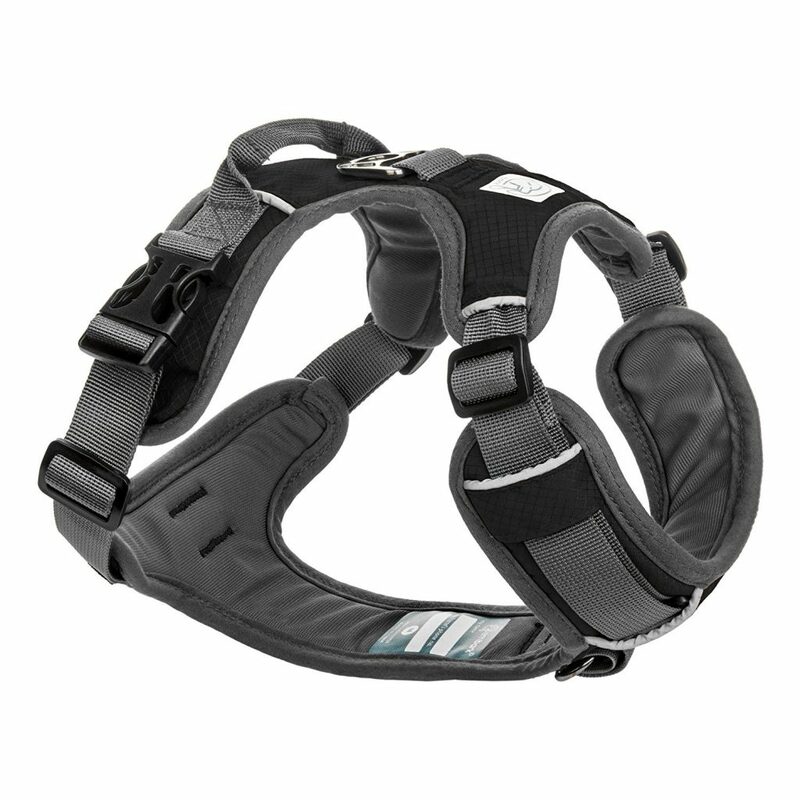 The harness requires no extra supplementary equipment and is a ready to wear ready to use the product. It has been tested to be as flexible as possible to allow ease in the movement of the dog and allow maximum repose. The nylon fabric is very durable, so you don’t need to worry about the harness wearing or ripping too quickly. The PowerLead Padded Walking Harness is fantastic value – coming in at under £10 in most stores. It’s a great starter harness for dog owners who just want a solid, reliable harness for short walks. This is the best choice for those look for a budget dog harness. The Rabittgoo No-Pull Dog Harness provides strong and smooth grip over your dog and is made of durable material. It consists of an adjustable slide strap which allows you to create a custom fit for your dog – this is important, as a good fit means the harness won’t cause any irritation or discomfort to your dog. It has two leash attachment points, one ring is on the chest side, and another one is on the back. The front attachment is used for no-pull use and dog training while back attachment applies to outdoor activities. 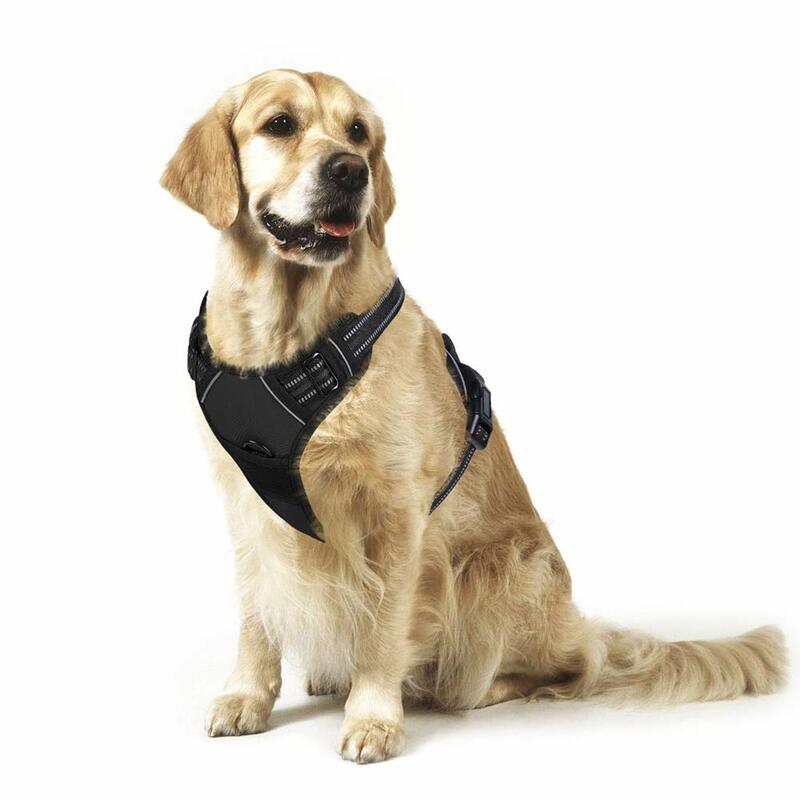 Its lightweight and comfortable fit means that pressure on your dog is evenly spread over it’s body – this reduces the pressure on the animal’s neck and in turn, this gives your dog much more freedom.. Reflective straps are also fitted on Rabbitgoo harnesses to ensure good visibility and your dog’s safety while out for a walk. It also has a sturdy handle which can be secured to a seat belt while your dog is in the car. The Rabittgoo No-Pull Dog Harness comes in different colours which helps to keep an eye on your canine friend in a crowded place. Although it is an adjustable harness, there are different sizes available, so measure your dog before buying. The Rabbitgoo No-Pull Dog Harness is a good mid-priced harness that’s reliable and helps you control your dog to ensure they aren’t causing injury to themselves when out walking. Great for dog owners who don’t need a higher end harness for full-day walks, but still want a quality product for their dog. Do you have a question about dog harnesses? Ask our community and see what they have to say. What harness is the best to stop your dog pulling? I’ve read that getting the wrong harness can be bad for your dog and cause them discomfort. While it is important to choose the right harness for your dog, I wouldn’t be too concerned about it causing the dog discomfort. They tend to be well-made and adjustable, which means they fit a wide range of dogs. Pick the right size for your dog and adjust it to fit and you’ll be fine. In terms of the “best” harness to stop your dog pulling, it can depend on a number of factors (how active you and your dog are for example). All the harnesses we recommended above will help train your dog to pull less. The Rabbitgoo is an affordable, all-round harness which is great, but the Embark and Julius K9 are great for more active dogs (if you’re doing long walks / hiking). Do dogs actually need to use a harness? What’s the point of them? Dog harnesses are more comfortable for dogs than collars, which helps keep them secure on the lead and helps reduce the amount of pulling they do. Are harnesses bad for dogs? I’m thinking about buying one for my staffy as he pulls quite a lot but I’m worried that it might be a bit too tight or might not be good for him. Is it better to use a harness or collar when walking a dog? No, harnesses aren’t bad for dogs. You need to get a good fitting harness to ensure that it isn’t too tight, but most pet shops will help with that. Harnesses are also great for stopping dogs jumping up on people (particularly younger dogs) as you can restrain them better without putting too much pressure on their neck (like a collar would do). The only downside is that as soon as you get the harness out, your dog knows it’s going on a walk, so getting the harness on is always fun! Does a harness help stop the dog pulling when being walked or is that more of a training issue? Yes, a dog harness will absolutely help stop your dog pulling compared to a collar. Basically, when you use a collar, it’s pulling your dog off balance, so he’s pulling back. The harness doesn’t do this, so he’s much more likely to walk without pulling (although some dogs may still do this). A harness is also generally more comfortable for dogs and allows you a bit more control, so it’s all-round good solution. Hi, newbie dog owner here. I have a question about harness size (picking the right one) – how do I go about it? How should I be measuring my dog? You should measure your dog around the widest part of their chest – that’s the part where the harness strap will go under. Then you can compare this measurement with the size charts that most retailers provide. Dogs аrе саllеd mаn’ѕ bеѕt frіеndѕ for a ѕіmрlе reason. Thеу are thе most loving аnd loyal creatures оn thіѕ еаrth. No one really knows why dogs love toys that squeak, though a few theories have emerged – have a read of some of the theories. A quick tale about the relationships between dogs – husky Gio meets his new sister, Aloy.